In placing your final bets for who will triumph in Sunday’s match-up between the Denver Broncos and Seattle Seahawks, it’s important for people who know nothing about football to consider factors others would deem utterly meaningless, i.e. the relative attractiveness of the quarterbacks’ significant others; the cuisines of the competing cities; snap inflation, which is a term we just made up; and, of course, whether The Simpsons already did it. And as the show’s Twitter account pointed out—like so many other future events either presaged or influenced by the show—the Broncos and Seahawks have played this match before, back in the 2005 episode, “Bonfire Of The Manatees,” with Denver besting Seattle 19-14. So, that settles that. 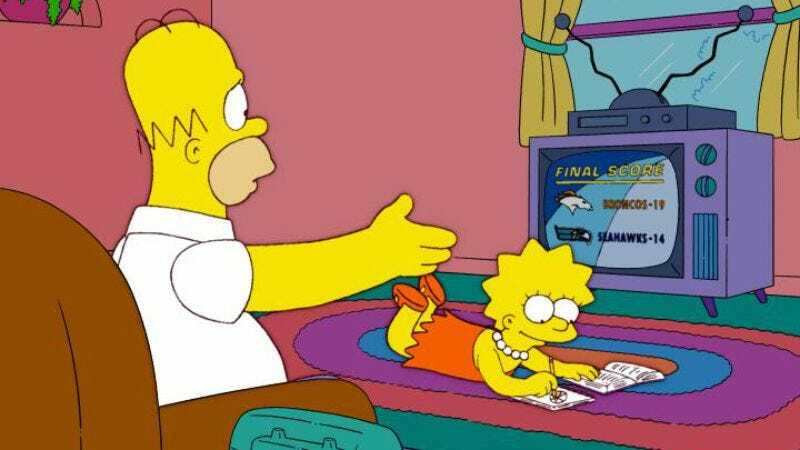 In the episode, Homer—having apparently regifted the Broncos, after Hank Scorpio generously made him their new owner—loses big by betting against his old team, on the advice of Professor Pigskin. His gambling debts lead to Fat Tony setting up an adult film shoot in his house, and an angry Marge becoming infatuated with a handsome marine biologist. So for those hoping to avoid a similar fate (and who don’t have access to their own pig with a system for predicting winners), perhaps you could do worse than bet on The Simpsons. What else are you going to do? Make an educated guess based on a careful deliberation of stats? Don’t be a nerd.